Van de Graaff Generator is a device for producing a larger electrostatic potential difference of an order of 10^7 (V). The Van de Graaff Generator was invented by a Robert. J. Van de Graaff in 1929, so the device got the name Van de Graaff Generator. The basic principle behind the working of Van de Graaff generator was Electrostatic Induction and Action of points. The top part of the Van de Graaff generator consists of a hollow metallic sphere which is mounted using the insulating pillars. The hollow metallic sphere is denoted by A. The top part of the Van de Graaff generator ( the metallic sphere) consists of a pulley B and the bottom part of the Van de Graaff generator consists of a pulley C.
The middle part consists of insulating pillars, inside which the belt passes through the pulley. The belt is made up of a silky material which moves continuously over the pulley. 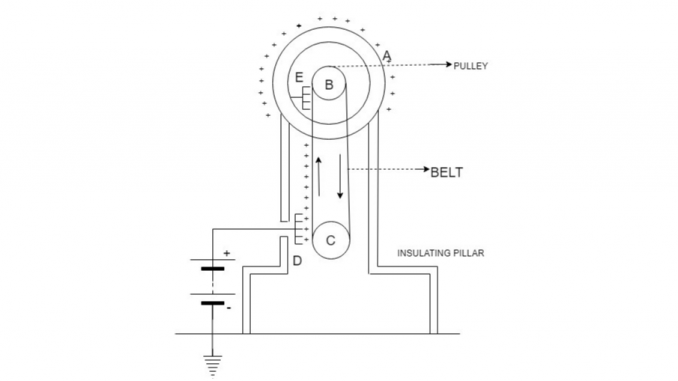 The belt is made to rotate with the help of an electric motor which is connected to the pulley. Two combs (conducting materials) E and D which consists of needles are placed at the top and the bottom respectively. The Comb D is provided with an electric potential 10^4 V.
The Comb E is placed inside the hollow metallic sphere. The High electric field near the Comb D, makes the air to ionize due to the action of points. The positive charges are repelled on towards the belt and the negative charges are attracted towards the Comb D.
The repelled positive charges which are stick to the belt is taken up to the Comb E.
Then the electrostatic Induction makes the Comb E to acquire a negative charge and the sphere acquires a positive charge. The ionization of air takes place at the Comb E and the negative charges are neutralized by the acquired positive charges. The neutralization of charges takes place at the pulley (B) region and the belt moving towards the Pulley (C) won’t have any charges. The process will repeat ‘n’ number of cycles and at one stage, there won’t be any spaces for positive charges and the leakage of charges will occur on the machine. The limiting point is a term used to denote the peak point before starts to leakage. By using the gas-filled steel chamber at high pressure, the leakage of charges due to an air ionization can be reduced. We are giving the input in the order of 10^4 volt but we are getting 10^7 volt. Leakage of charges at the final stage of each and every cycle. The high voltage produced from this Van de Graaff Generator can be used to accelerate protons and deuterons for the purpose of nuclear disintegration.